The Trending reports on EC2 provide cost and usage over time metrics for the EC2 instances running in your AWS deployment. To access the trending reports, go to the left navigation pane and choose Inventory > Trending > EC2. The EC2 History by Time report shows the number of hours run and the billed cost for instances in a given time period. To access this report, choose Inventory > Trending > EC2 > History by Time. Click to create a filter. 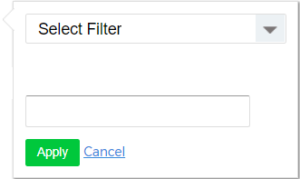 After you select a filter, select is equal to or contains from the second drop-down menu, type your search keywords in the third text field, and click Apply to filter the data by your selections. In this example, we selected region as the filter with the keyword US. You can select a data and time from the Start and End options if you want to configure a custom date range. By default, the report will show the past seven days. You can also group the data by selected filters. If you do not choose any options, the report will show hours for all EC2 instances that were running during the selected time range. In the Group By section, you can add multiple filter options by clicking (green plus icon). Click (red minus icon) to remove any selections in the Group By section. Total Number of Instances Running: the total number of EC2 instances that were running at any point during the selected date range. After you generate a report, you will see two charts based on your filter options. The top shows the number of hours all instances were running for the day. If you choose to display hours instead of days when filtering, CloudCheckr will not display this chart. The second graph shows the total number of instances that were running for each day/hour. You can click any point on the graph to be redirected to the EC2 History by Instance report, which will provide a complete list of all EC2 instances that were running for that day/hour. You can also export the data from the report into a CSV file by clicking (Save as CSV) button. The EC2 History by Instance report shows the total number of hours running and the total cost for specific instances.To access this report, choose Inventory > Trending > EC2 > History by Instance. The filters and functionality for this report are the same as the EC2 Instance History by Time report. 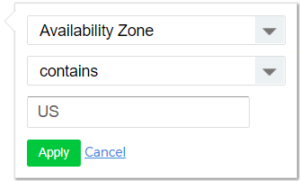 You can click on any instance in the list, which will redirect you to the EC2 Instance History by Time report, filtered by that specific instance. 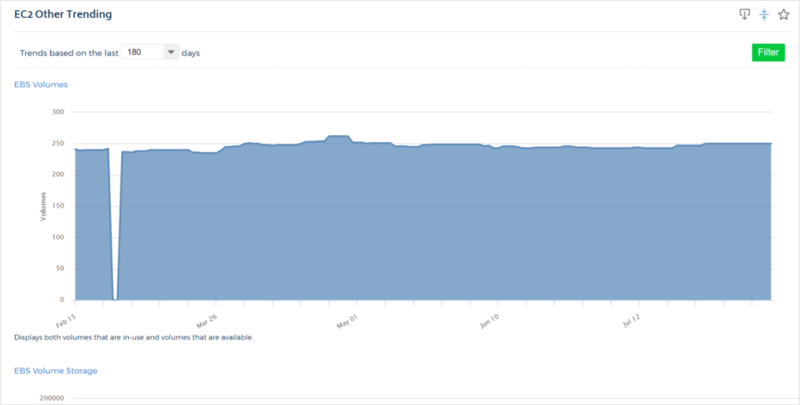 The EC2 Instance History by Pricing Type report shows the trends for each pricing type of EC2 instance (EC2 instance, on-demand EC2 instance, reserved, and spot) based on a selected time period.To access this report, choose Inventory > Trending > EC2 > History by Pricing Type. Click the Trends based on the last...days drop-down arrow to change the number of days. Options include 7, 30, 90, 180, or 365. Click Filter to generate a report based on the number of selected days. Hover over a point on the graph to see the number of EC2 instances for a selected date. The EC2 Other report shows shows the trends for other data points associated with EC2 instances based on a selected time period. These data points include the following: EBS volumes, EBS volume storage, Elastic Load Balancers, Elastic IPs, Active Reserved Instances, Amazon Machine Images, and EC2 Security Groups. To access this report, choose Inventory > Trending > EC2 > Other. Hover over a point on the graph to see the number for the selected data point on a given day.